Anyway, I digress. Do you find yourself at the end of the fresh garden season with an enormous amount of cherry tomatoes like I do? If not, you will still enjoy these recipes, but will just need to go to the store to buy some tomatoes. Immediately! 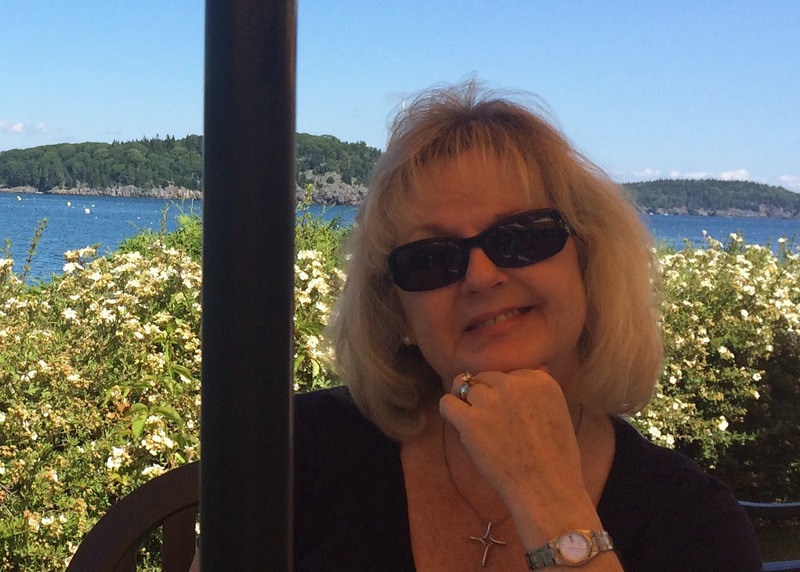 First, I have a recipe for what has become one of our favorite summer side salads. And by favorite, I mean we have it at least twice a week! It incorporates some much loved ingredients, and is a great way to turn those plentiful cherry tomatoes into something really easy, fresh and tasty. 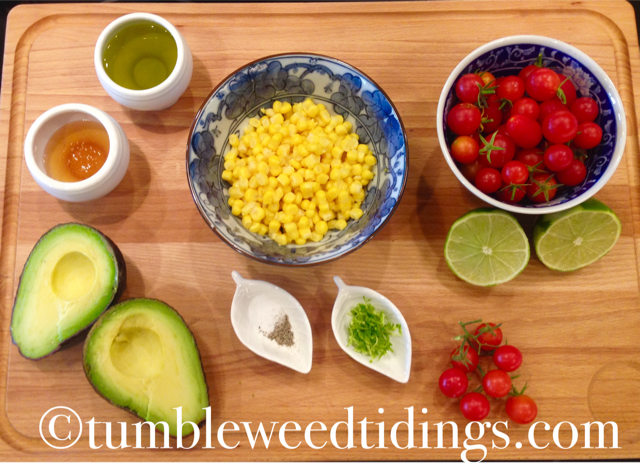 I have seen other versions of this recipe, but this is how I make tomato, corn and avocado salad. Clean cherry tomatoes and slice in half. 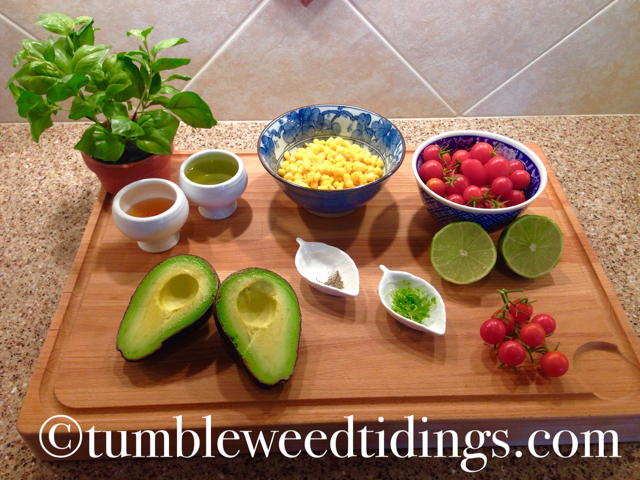 Place tomatoes, diced avocado and corn in a mixing bowl. In a separate bowl or glass measuring cup, mix the olive oil, salt, pepper, honey, lime zest and lime juice. Mix with whisk and pour over corn, tomatoes and avocado. Serve cold or at room temperature. Enjoy! The second recipe for cherry tomatoes is a Greek Orzo Salad. Again, a great use of cherry tomatoes, and a fresh make ahead salad. It can easily be turned into a main course salad by adding some diced chicken, tofu, or other protein. I have also made this salad using cooked barley and it is equally delicious! Cook, rinse and drain pasta. Stir all ingredients together and refrigerate to give the flavors a chance to meld together. Serve cold or at room temperature. Enjoy! There are many other ways we find to use our overabundance of cherry and grape tomatoes this time of year, including other salads, Bruschetta, and just eating them straight from a bowl on the kitchen counter. I hope this will inspire you to find new and interesting ways to use up this summer garden favorite while there are still a few hanging around. And by the way, I say tomato with a long a (tə-mā′tō)! I will be trying these salads. Again, this was very interesting. I have really gotten behind on my computer.